Able to cover an entire room with crisscrossing beams from floor-to-ceiling and wall-to-wall, the LED Mushroom is also linkable with the Kinta X and Double Derby X. This updated classic fixture is ideal for mobile applications. The LED Mushroom alternates dynamic effects with continuous rotation or back-and-forth motor control. At the heart of the LED Mushroom are high-power LEDs, consisting of one red, one green and one blue 3W LED—each with a 50,000-hour lifespan. 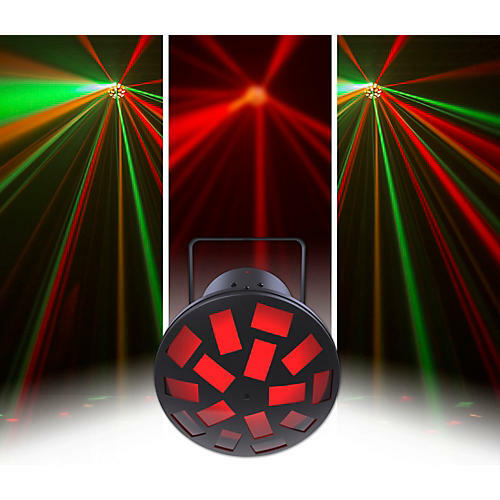 The result is an exciting visual display with bright, vibrant, colorful beams with an ultra-wide 130° coverage angle. Take full advantage over the LED Mushroom's abilities with DMX control, or simplify your life using its built-in automated and sound-activated programs. Either way, this versatile fixture may prove to be the only light you need in your gig bag. All DMX products - 2 year limited warranty. Special Effects controllers and fixtures - 1 year limited warranty. "NV" products - 3 months limited warranty. (All warranties are in effective from date of purchase.) No warranty on lamps, laser diodes, fuses, brushes, and belts.